Thomas Woodrow Wilson was inagurated as the 28th President of the United States on March 4, 1913. His two-term administration was among the most notable in U.S. History. In 1917, during his second term, the United States entered the First World War and Wilson played an international role in the negotiation of the Treaty of Versailles and the organization of the League of Nations. “Tommy” Wilson (1856-1924) lived in this Manse from 1860 to 1870 while his father served as pastor of the First Presbyterian Church. Tommy spent the formative years of his childhood in Augusta, years that would affect him for the rest of his life. While living in Augusta, Wilson experienced the hardships of the Civil War and Reconstruction. He also began his education, tasted leadership as president of the Lightfoot Baseball Club, and grounded his deep Presbyterian faith. 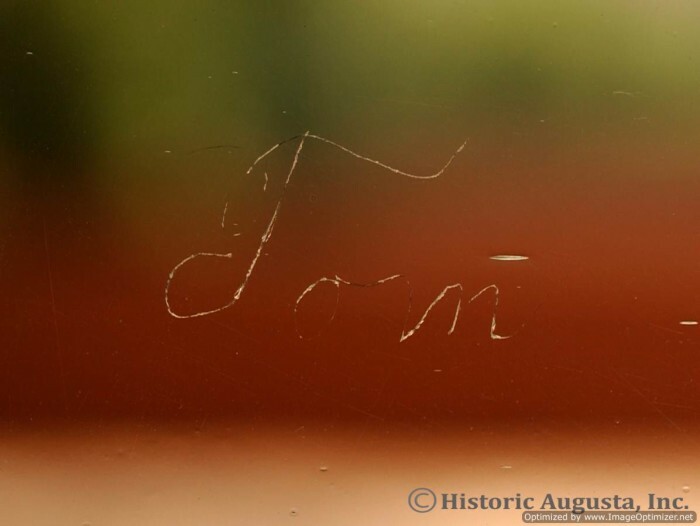 The image shown here is of the pane of glass in the Best Room where young Tommy began to etch his name into the window with his mother’s diamond ring. The etching can still be seen to this day and is a favorite memory of visitors to the house.